Fall sports have recently started here at OP. 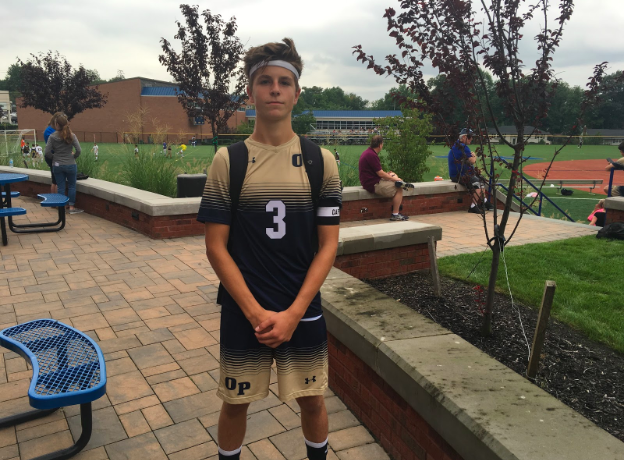 On Saturday, OP soccer picked up its first win of the season over Brearley (4-2). OP Soccer is often an exciting product who always has a fighting spirit and brings their best effort to every game. A fighting spirit is exactly what the team’s captain, Jake Wright, has. Jake contributed a goal and an assist in the victory. As a member of the OP Cross-Country team (who shares the field with the soccer team), many of my teammates and I see the dedication and effort Jake puts in for the team he captains. Besides captaining the soccer team, Jake is the head Rowdy (OP’s student section), and one of the most recognizable seniors in the school. I caught up with Jake after Saturday’s victory. I asked him about his team, their goals for the season, and about himself. Thank you to Jake for answering my questions. Joe: Hello, Jake. After a winless three games, I bet it felt good to get into the win column. Jake: It felt great. I think it definitely restored a lot of confidence in the boys. It gave us the hope we needed for the rest of the season. We are a really talented team and it was surprising and frustrating to not come out with a win in our first three games. We earned this one (against Brearley) and deserved it, so it feels really good. Joe: Obviously losing two straight to two tough opponents (Union and Governor Livingston respectively) is agonizing, but were there any lessons your team learned from those two games? Jake: I think we found out that we had to work as a team more and come out with the right energy. Coach Barresi and Coach Daugherty made us realize that there is a lot more that goes into the game than just effort. Our guys give 110% but the results were not showing that. We realized we have to be a lot better at the technical aspects of the game. We have to control the ball better and move it up the field and across the field in a more smooth and fluid way. These losses came from a lack of touch that resulted in a turnover and ultimately a counterattack from the other team. For us working hard is a given, but we have really focused in on our skills and particularly our finishing. We all know the only way you win a game is by scoring and to score four goals in our last game has shown that we are improving in that department. Joe: With that being said, who has stood out and really stepped up so far? Jake: I think there are a lot of guys who have stepped up. But one, in particular, is Marcelo Freire. I don’t know how many people know Marcelo. He was a freshman last year, and he started on Varsity as a freshman. He is a sophomore now, and he may be the smallest guy on the team but he is also the most talented. For his height and age, his touch on the ball and his Soccer IQ are unbelievable. It makes the team realize that no matter how tall or small you are, it comes down to how good you are with the ball. He is a very valuable asset to the team. When we played Union on their senior night, Marcelo ran up the field near the midfield line and got a bouncing pass right off the turf at knee height across his body. He looked up and saw the goalie off his line and shot the ball on a one time volley from about 40 yards out and scored. He scored a 40-yard volley against Union on their senior night. I thought that was the best goal I’ve ever seen while I was on the field. Joe: For the season as a whole, what would you guys like to accomplish? Jake: I would love to see the team win more than half our games. I think we are a really talented group and have a lot of potential. I would like to see more winning streaks from here on out. I don’t want to see any more 4-0 losses like we had last year. I think this is going to be a team where there are a lot of close, hard-fought games. If we keep putting plays together like we did against Brearley I think we have a good chance to do something special. Joe: Personally, what would you like to accomplish? Jake: For me, I would like to see myself be a leader on the team, a leader that the players look up to, someone that people can say was a good guy and a good player. A lot of it for me is the character aspect of it. I want to set a good example for the team going into the future. It’s not about the individual, it’s about the team. Joe: Who is your favorite player? Jake: One of my favorite players is Eden Hazard. I’m not a big Chelsea or Belgium fan. I am definitely a Hazard fan because of his mentality and his level of play is really unmatched. He works so hard and his continuous movement at full speed is something that is really impressive. Joe: Finally, as Head Rowdy is there anything you would like to tell the student body? Jake: I hope you guys really think about how important it is to the players for you to come on out to the games. I know everyone is busy this year and has a lot on their schedules. But if you could take an hour and a half and cheer for your friends and schoolmates, it would mean so much to the players. This year we would really appreciate it if you guys came out to soccer games and every other sport going forward. I will be there and I hope you guys will be there too.